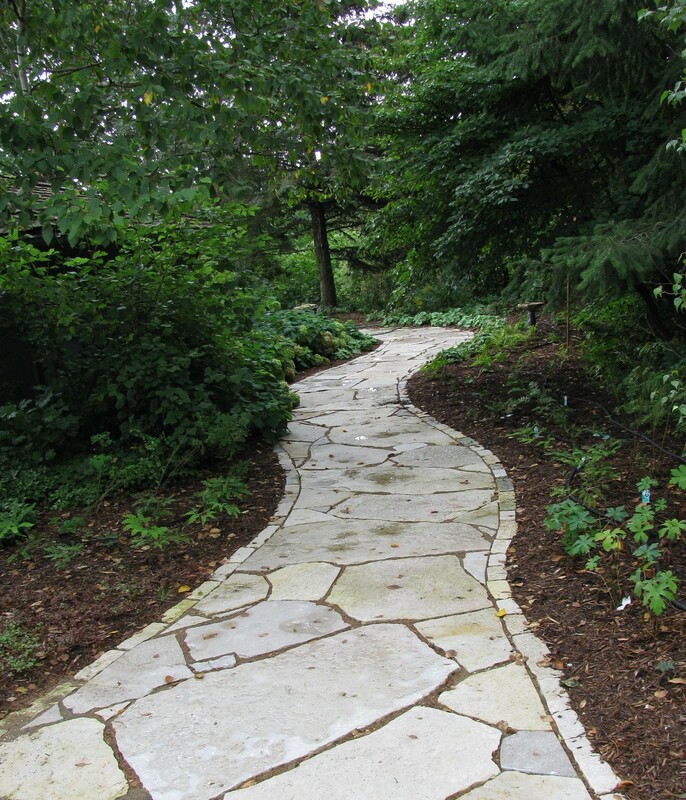 Whether it meanders through your garden or leads guests in a beeline to your front door, a natural stone pathway forms an eloquent bridge between a home and its surroundings. Design possibilities are almost endless, allowing homeowners to unleash their creativity and make a statement that is truly their own. 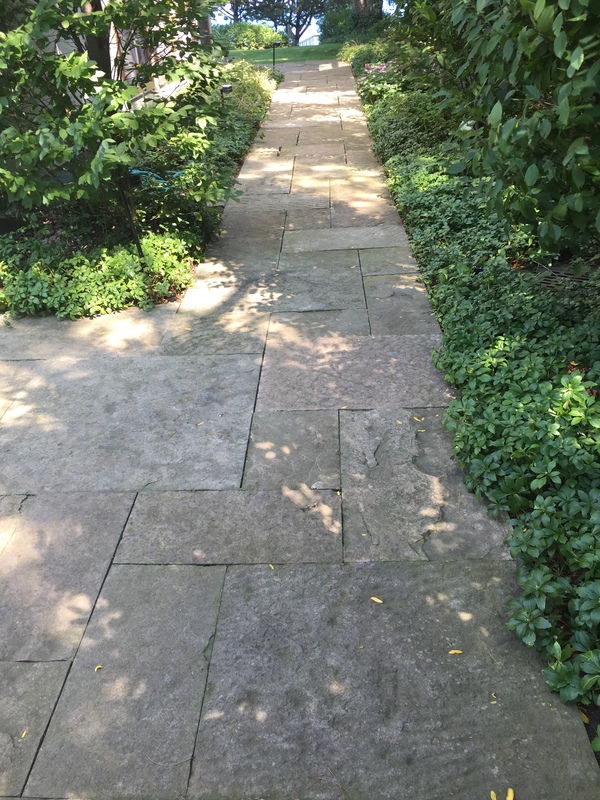 To build a pathway, you’ll want to use flagstone, which is not a type of stone, but a generic term for stones that naturally have a flat surface and break into irregular pieces a foot or two in length and ¾ of an inch to three inches in depth. Flagstones can be limestone, bluestone, sandstone, quartzite, and even some granite, and each type of rock comes in an array of shades and textures. Chilton dolomitic limestone flagstone. Photo courtesy of Buechel Stone. Limestone is typically grayish, with some multicolor purples and reds, said Aaron Thieret, owner of Earthworks, Inc., a natural stone distributor in Perryville, MO. Bluestone is typically grayish-blue, as the name implies, but individual stones can range from reddish to green-tinted. Sandstone comes in earth tones of browns, tans, and oranges, but can also have a charcoal hue. Quartzite can be gray, gold, green, or yellowish, and often contains particles that sparkle or shine. But before you get carried away with a color palette, consider your climate. 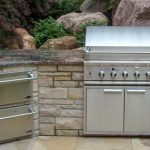 If you get freezing temperatures in the winter, you’re best off using a dense stone like bluestone or quartzite that can withstand the cold. Sandstone and limestone are more porous, and can absorb water that could crack the stones when it freezes, though there are exceptions, such as Eden, a hard Wisconsin limestone that’s a popular choice at Earthworks. 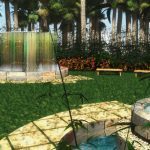 You can design a pathway to lead to a home or a garden feature like a fountain, or use it as a border around planting beds. You can lay your stones in a straight line or an S-curve, or widen or narrow the pathway along its course to create an hourglass effect. You can also make purely decorative designs, like a nautilus shape or a flagstone starburst surrounding a circular stone. For a pathway, you’ll want to plan for 30 to 36 inches in width to be comfortable for one person to walk along. For two people walking side by side, you should have at least 48 inches of width. 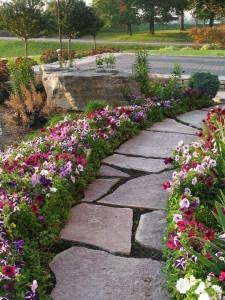 Fond du Lac dolomitic limestone flagstone and landscape edging. Photo courtesy of Buechel Stone. Once you have a design in mind, it’s time to prepare a bed for your stones. Use a sod cutter or a shovel to dig four to six inches deep, rolling up the sod if you’re using a shovel. If you have a complex design, it’s a good idea to mark the path’s definition by using stakes, then filling in the contours with upside down spray marking paint. In the bed you have dug, lay a base of crushed rock that contains “fines,” or fine stone dust. Todd Darnell, manager of Cascade Stone Supply in Burlington, WA, recommends using 5/8th-inch minus, which gives you plenty of powder to compact and allow your path stones to stick in their beds. Fill the bed to two inches below the surface so that you can raise or lower stones of varying heights to make them even. Tamp the base down or wet it to compact it. Sandy Creek dimensional quartzitic sandstone. Photo courtesy of Lurvey Landscape Supply. After laying your bed, select stones in the color and texture of your choice. Stone is sold by the ton. 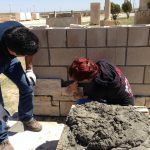 Calculate your area and assume you’ll get 80 to 100 square feet of stone per ton, depending largely on its thickness. “After you get your stone, then the work really begins,” Darnell said. Set the stones in the bed, adjusting them to create an even height. Use a level if you need to, especially for a high-traffic area like a home entrance, so that people won’t trip. You can space your stones half an inch up to four inches apart, depending on the look you want. Some people even use a skill saw with a diamond blade to cut their stones and fit them tightly together, almost like a jigsaw puzzle. Thieret recommends putting polymeric sand, available under various brand names, in the joints between stones to bind the base material together. 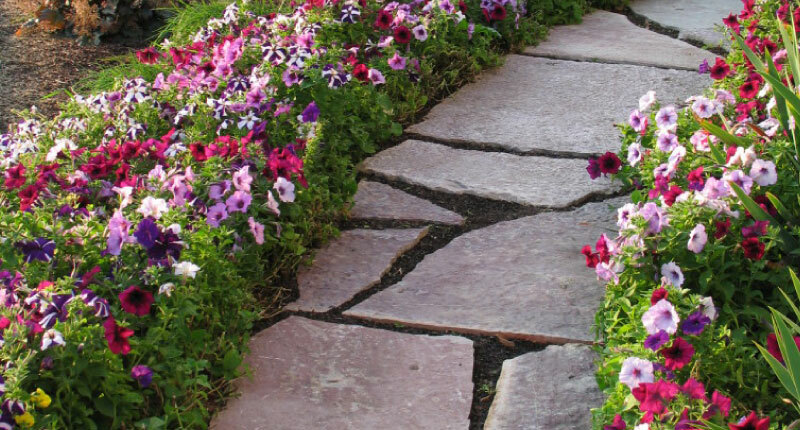 As an added precaution to keep stones in place, you can use plastic or aluminum paver restraint, also called paver edging. Once it’s set, your stone pathway will last as long as your home or even longer, providing many years of enjoyment for your family and inspiration for your guests.